Les Batignolles was the district where Édouard Manet and many of the future Impressionists lived. 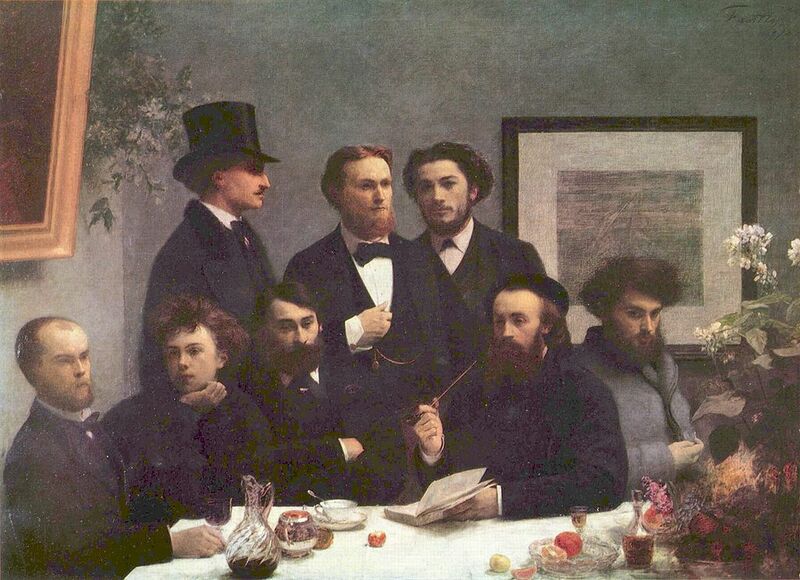 Henri Fantin-Latour, a quiet observer of this period, has gathered around Manet, presented as the leader of the school, a number of young artists with innovative ideas: from left to right, we can recognise Otto Schölderer, a German painter who had come to France to get to know Gustave Courbet‘s followers, a sharp-faced Manet, sitting at his easel; Auguste Renoir, wearing a hat; Zacharie Astruc, a sculptor and journalist; Émile Zola, the spokesman of the new style of painting; Edmond Maître, a civil servant at the Town Hall; Frédéric Bazille, who was killed a few months later during the 1870 war, at the age of twenty-six; and lastly, Claude Monet. Their attitudes are sober, their suits dark and their faces almost grave: Fantin-Latour wanted these young artists, who were greatly decried at the time, to be seen as serious, respectable figures. Only two accessories remind the spectator of the aesthetic choices of the new school: the statuette of Minerva bears witness to the respect due to the antique tradition; the Japanese style stoneware jar evokes the admiration of this entire generation of artists for Japanese art. In this group portrait exhibited at the Salon of 1870, each man seems to be posing for posterity. The painting confirms the links between Fantin-Latour and the avant-garde of the time and Manet in particular. It echoes Zola’s opinion of Manet: “Around the painter so disparaged by the public has grown up a common front of painters and writers who claim him as a master”. In his diary, Edmond de Goncourt sneered at Manet, calling him “the man who bestows glory on bar room geniuses”. When Eugène Delacroix died on August 13, 1863, the modesty of his funeral was seen as an insult by all those who considered him to be one of France’s greatest artists. Henri Fantin-Latour, especially, was outraged that no official tribute had been made. 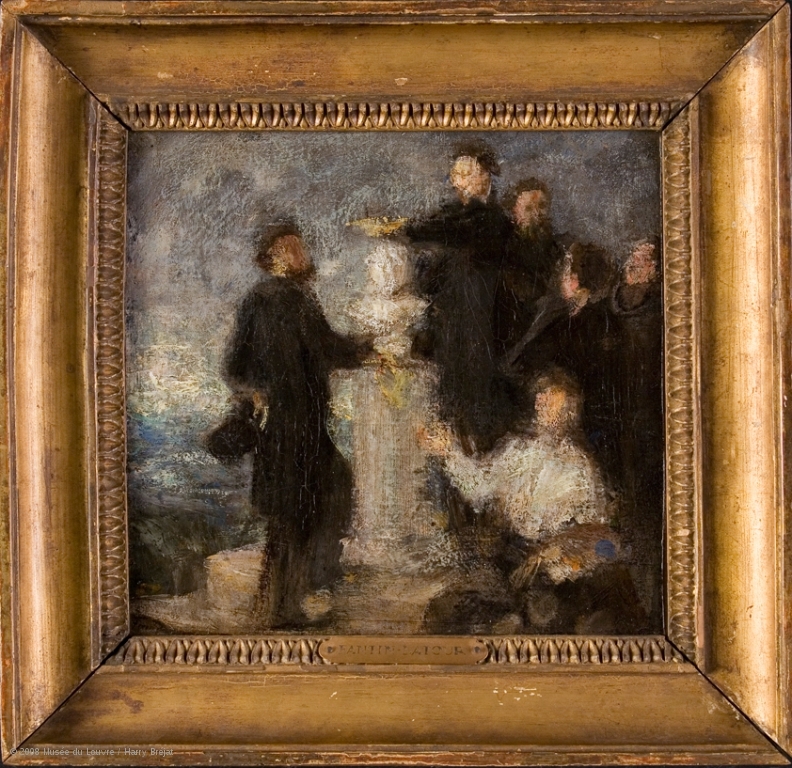 As it was common in the 19th century to celebrate prominent figures, he wanted to raise this monument himself with a manifesto painting that reunited the tenants of the modern movement, which he exhibited at the Salon of 1864. This sketch bears witness to the first project, in which six artists are gathered around the bust of Delacroix, crowned by one of them. 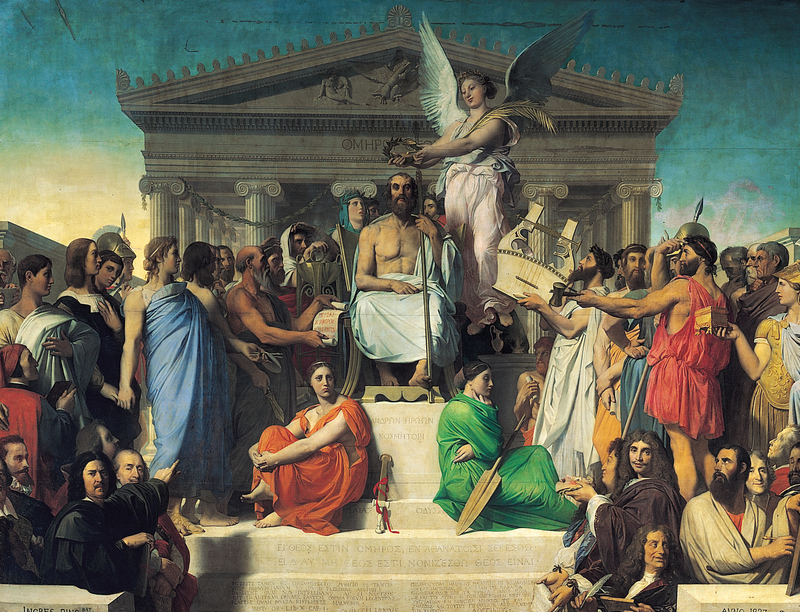 While it is clear that Fantin made deliberate reference to the coronations of the great men of theater on stage, the most striking source of inspiration for this artwork remains the 1827 painting by Jean-Auguste-Dominique Ingres, Apotheosis of Homer. The artist made use of the same pyramid composition, with the bust of Delacroix placed in the center. Fantin, who depicts himself in the lower right of the composition with his palette and painter’s smock, draws the viewer’s eye to the object of veneration. By making reference to the painting by Ingres, he thus renders the significance of his work more easily understood: Delacroix, like Homer, embodies the genius that will be passed on to the next generations. The identities of the other figures in the sketch are more difficult to ascertain. They can nonetheless be deduced from the first list on a preparatory drawing with the names Legros, Whistler, Manet, Bracquemond, Duranty, Cordier, Myrionnet, and Régamey. After producing a number of sketches for this painting, Fantin eventually decided on a final version that is housed at the Musée d’Orsay and far removed from this drawing. The final composition removes Myrionnet and Régamey, replacing them with Baudelaire, Champfleury, and Balleroy. The contemporaries are now positioned around a painted portrait of Delacroix, and no longer a bust. 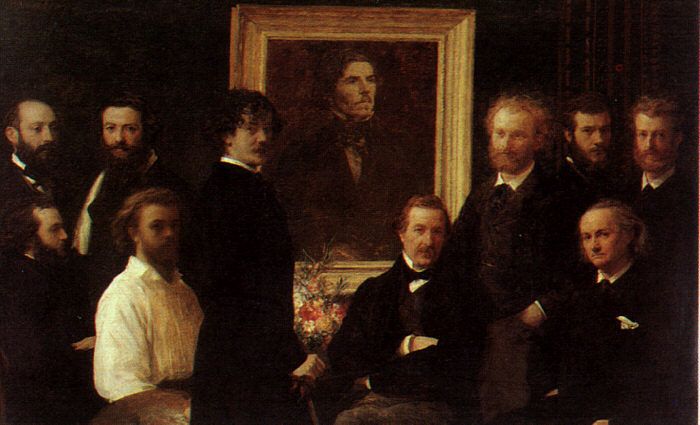 Seated: Louis Edmond Duranty, Fantin-Latour himself, Champfleury et Charles Baudelaire. 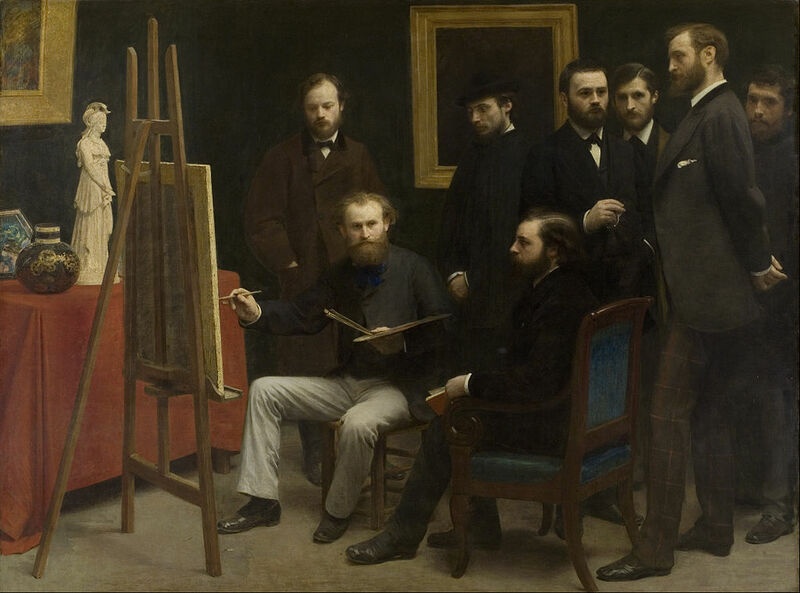 Standing: Louis Cordier, Alphonse Legros, James Whistler, Édouard Manet, Félix Bracquemond et Albert de Balleroy. 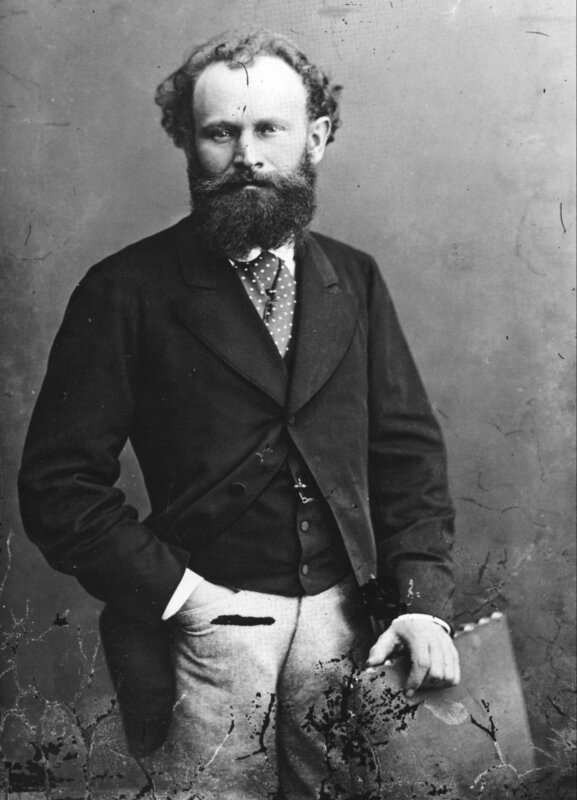 Édouard Manet was at the peak of his notoriety when the young Henri Fantin-Latour exhibited this portrait at the Salon of 1867. Manet himself chose not to submit any work that year, having had his submission rejected by the 1866 Salon jury. 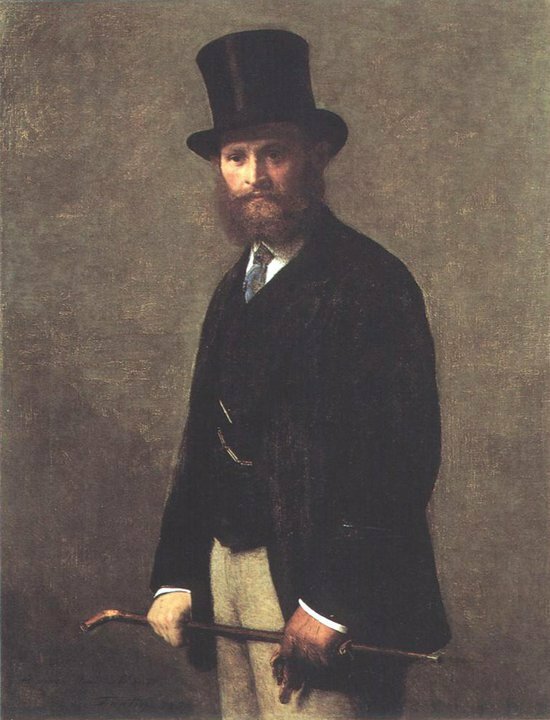 In this commanding image of the great French artist, Fantin portrayed Manet not as a painter, but as a flâneur, a sophisticated man-about-town whose eyes are open to every nuance of modern life. The background of the painting is almost completely blank, both in homage to works by Manet and in emulation of photographic portraits of the period.